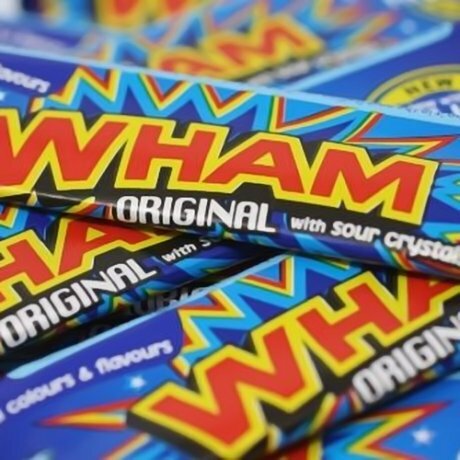 Wham Bars - Absolutely POPtastic! Think of all things 80s: Rubik's Cubes, leggings, garish plastic earrings 'a la Pat Butcher', shaggy perms, electric blue eyeshadow, Screwballs (remember that ice cream in a funny triangular plastic cup with a ball of bubblegum at the bottom), and ...WHAM BARS! Yes, the Wham bar is indeed iconic, and takes pride of place in the 80s Hall of Fame. 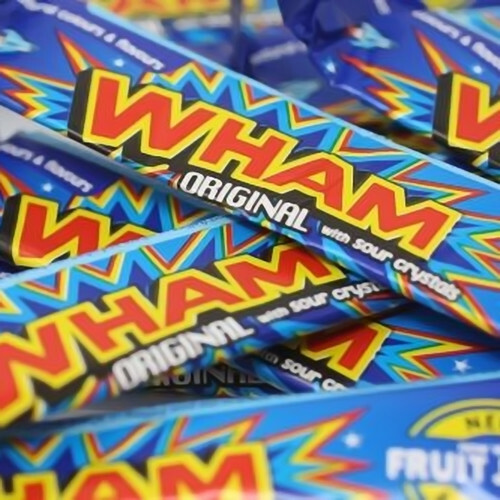 You just weren't a cool cat if you didn't pop into the sweetie shop on the way home from school to pick up a couple of Wham Bars. For those of you who missed this momentous experience, and are not familiar with this classic retro sweet, Wham bars are lovely tongue-tingling raspberry flavour chewy bars with little bits of fizzy stuff embedded in the chewiness. They are totally fab, and it's worth getting them just to admire the stunning blue galactic wrapping they come in - it's retro-futuristic/pop-art at its best!